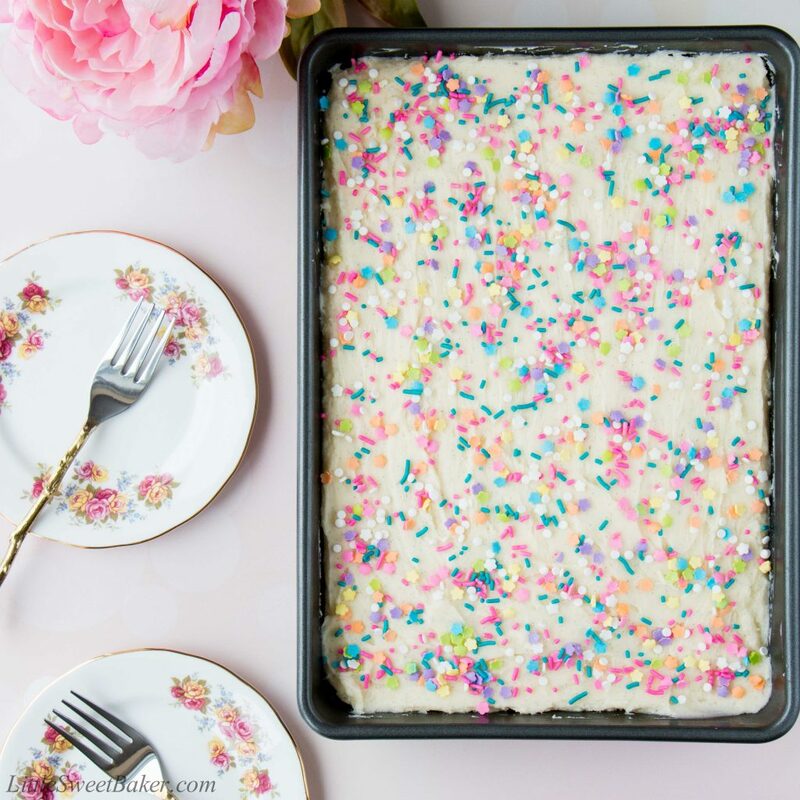 This delicious vanilla sheet cake is soft, moist and topped with a fluffy vanilla buttercream. It’s the ultimate dream cake for vanilla lovers. 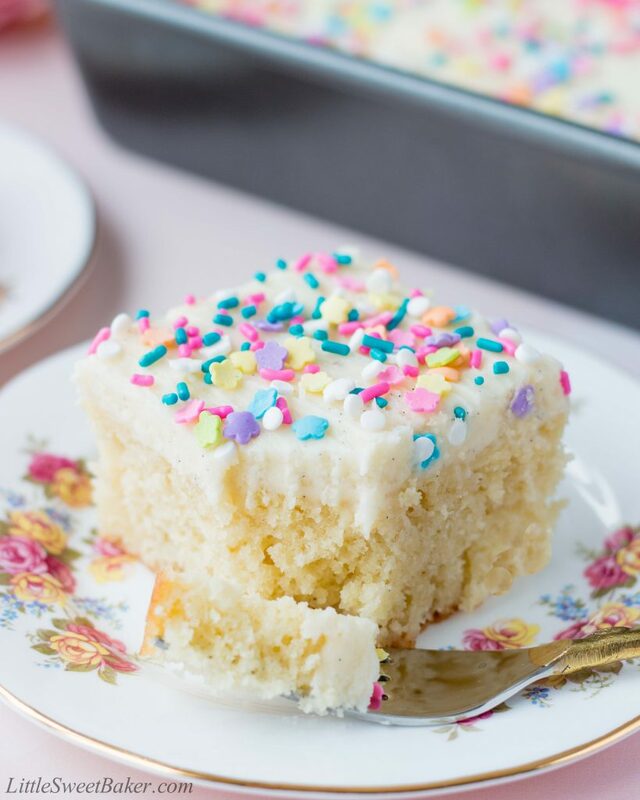 There is just something nostalgic about a simple vanilla cake. It reminds me of childhood birthday parties and other special celebrations. 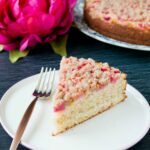 A good vanilla cake is bright and beautiful without being over-the-top fancy which makes it suited for any occasion. 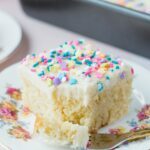 There are no unique ingredients in this vanilla cake recipe, just your everyday pantry staples. The only trick is to have all your ingredients at room temperature. I made that mistake the first time when I added in my cold wet ingredients and ended up with a very lumpy batter. The texture of the cake was tough, not tender at all. So you want to make sure you have all your ingredients at room temperature before you get started, and you want your batter to be smooth and homogenous without over-mixing. 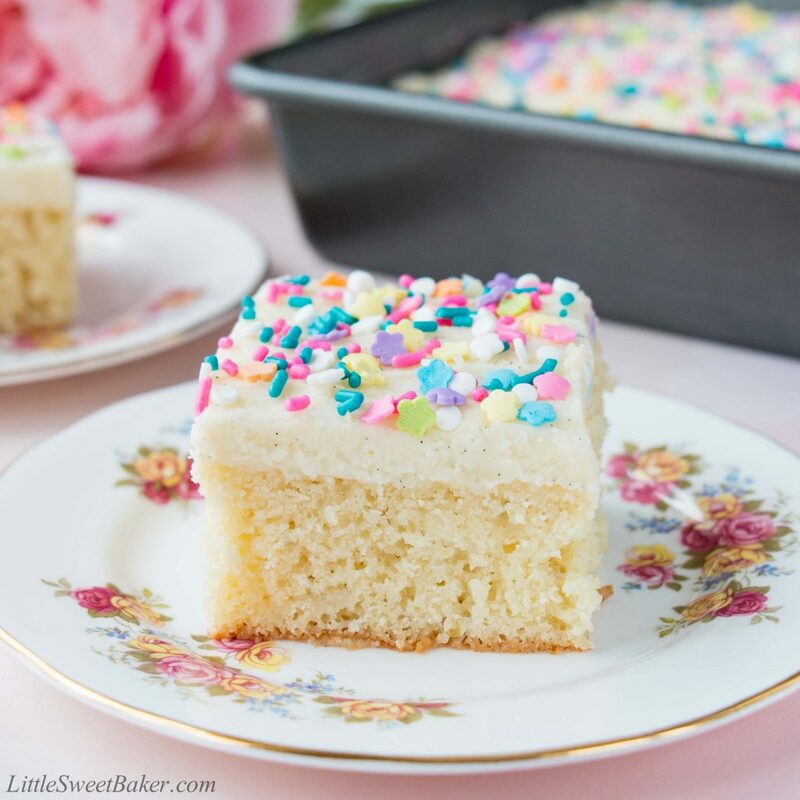 This vanilla sheet cake is soft and moist with tender crumbs. The flavor is rich and buttery with a lovely vanilla aroma. The buttercream is fluffy, creamy and just melts in your mouth. Preheat the oven to 350F degrees. Grease and flour a 9×13 inch baking pan. In a medium-sized bowl whisk together the flour, baking powder, baking soda and salt. Set aside. Using an electric mixer or stand mixer with paddle attachment, beat the butter and sugar together until fluffy (about 2 minutes). Add in the 2 large eggs, 2 egg whites and vanilla extract and continue beating until combined (about 30-60 more seconds). Scrape down the sides of the bowl as needed. Then beat in the sour cream, followed by about 1/2 of the flour mixture. Finally, beat in the milk followed by the remaining flour mixture. Be careful not to over mix.Pour the batter into the prepared pan. Bake for 30-35 minutes or until an inserted toothpick comes out clean. Allow the cake to cool fully before frosting. Beat butter, salt and vanilla until light and fluffy. Beat on high speed for about 1 minute after the last addition of powdered sugar for a fluffy and airy texture. Spread on cooled cake and decorate with sprinkles if desired. Recipe adapted from Oh Sweet Basil by Just So Tasty. I’ll be sharing this at Fiesta Friday #210 hosted by Angie, co-hosted by Laurena @ Life Diet Health and Jhuls @ The Not So Creative Cook.